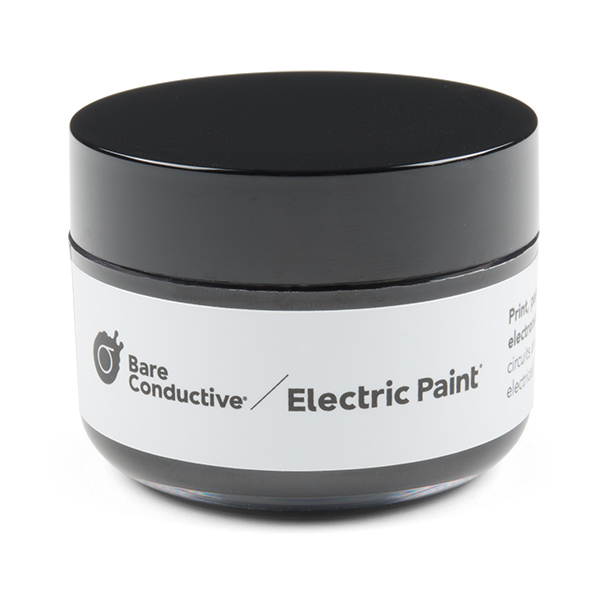 You can apply Bare's Electric Paint like any other water-based paint. You can use a brush, a roller, printmaking equipment, some intrepid users have even tried to spray the material through an airbrush! It's important to note that as Electric Paint dries the conductivity increases (and will continue to increase to a certain extent even after the paint "feels" dry), so if your project requires calibration, let the paint dry completely before testing it. Can Electric paint be diluted? +1 if you want to see this mixed with Polymorph! Isn't this the stuff you repair the rear defroster with on an old car? No, that stuff is a silver concoction. What is the shelf life in the surface? Anyone consider how this might affect the WiFi coverage near a wall painted with this stuff? Does anyone think that this would be a good idea to use for a membrane switch plate? Has anyone used this on tile with any success? It says this paint is not meant for use on skin. 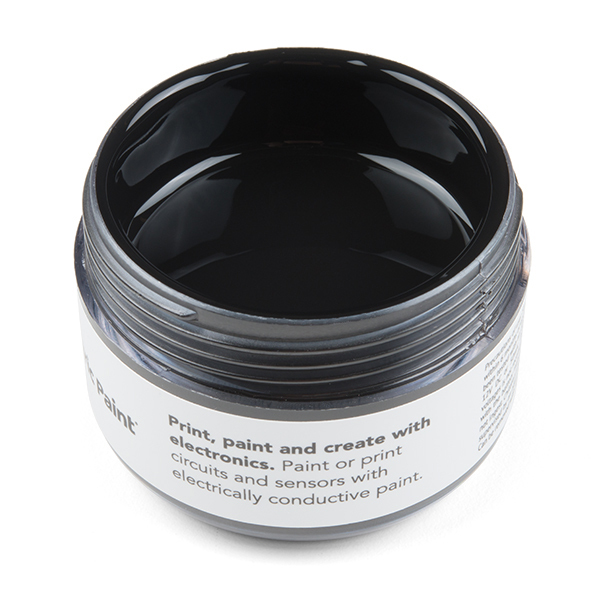 Is there an electrically conductive paint that is for use on skin? I recommend reading the MSDS before use. One of the ingredients is allergenic which means you might want to turn down the Sparkfun hyperbole and not use it on clothing or fingerpaint with it. Note the resistance chart. This might better be called resistive paint. For conductivity try lessemf 's copper based paint. My comment about open windows and fan is adequate for hobbyists who use it sparingly. If at a production level type of exposure (8 hours a day), proper organic vapor masks (any safety supply store will have) and proper ventilation are required. Details in MSDS. I work at MG Chemicals (we manufacture the above products) and a big fan of Sparkfun. Leave a few comments for the Sparkfun team if you want them to distribute these products :) Thanks! Just read some comments about the safety issue of these products. It is not something you want to sniff--like paint thinner or even fumes from soldering for that matter. All you need to safely work with these products is a ventilated room (window open and fan blowing fume away from you). The Conductive Epoxy is a non solvent based product so very safe to work with. I wonder if this stuff is bad to breathe? It looks like it's made of carbon. I would imagine that if you're breathing enough dust from the dried paint to do you harm then you're doing something very wrong. It isn't often you meet a charcoal or graphite artists whose occupation has given them the "black lung"! Interesting product. How fast does it dry? I am asking because it would be great for kids to play with this but if it drys in 4 hours then it can't be used in a 1-hour workshop. FYI, we use black conductive paper in physics labs for electric field mapping. I'd like to see SPE carry it as well. Obviously drying time depends on the thickness of the paint, but it behaves roughly the same as acrylic craft paint. In other words, to be dry to the touch is probably something like 15 minutes. Although it does continue to "dry" after that and the resistance continues to decrease to a certain point. You can speed up the drying process by blowing hot air on it to evaporate the water out of the paint but drying too fast will cause the paint to crack. Also, remember basic painting rules like "fat over lean," if you plan on layering it with non-conductive paints. Could this be used to repair worn-out contacts on the rubber buttons found inside remote controls? That sounds like a pretty inventive use for it. Let us know how it works if you end up trying! So from your resistance chart it looks like the sheet resistivity is around 30 to 35 ohms per square. Long runs are going to be highly resistive. Still, lots of cool uses. Out of curiosity, if I etched and drilled a 2 sided PCB at home, and used this paint to create the vias from one side of the board to the other, what are the chances it may work? Due to all the unknown factors, I'd venture that isn't the best use for this stuff. In your case, it's common to solder a bare copper wire through the via to both sides of the board, then clip off the excess. I'd agree with that. This isn't going to be a very good or very reliable via. But remember, if you are using through hole components every chip pin lead is a free via -- just solder both sides of the board. For what few vias you have left, do what Mike says -- you're going to be clipping off a bunch of resistor and cap leads anyway, so you have plenty of prepped wire. The manufacturer told me that the paint have a life of 6 month post production/storage. I want to buy a bottle but I dont know if you going to give me an old or new one! Or there is no problem? Thank you, Robert!!! I want one of those ;_; you guys should carry them, there would suddenly be an EXPLOSION of clear PCBs made out of plastic! I've actually just uploaded an image representing my experience with the paint. It shows the relationship between length and resistance in straight lines of varying width. Obviously these numbers change when you thin the paint or when you paint multiple layers. Hope it helps! The manufacturer told me that the paint have a life of 6 month post production/storage. I want to buy a bottle but I dont know if you going to give me an old or new one! Or there is no problem? We generally have about a 2-3 month supply on hand. We stock it as it comes in, so you would always be buying our 'freshest' stock. It would just be best to buy it when you need it. They do not yet have a technical datasheet with any of that information. I'll post it when it's available. My point is that there are pens and such that are MUCH easier to apply that would work better for the application you're talking about. Also can you check the resistance of this stuff + the rough viscosity of it for possible application as a 'ink' in a DIY printer cartage in a printer? I will be doing a demonstration with it next week in the product post. I'm not sure if I will go into that much depth with it, but we can at least take some measurements and go from there. Did the job. Used a silkscreen design and worked fine. Unfortunately after a while it does begin to crack. Solved it temporarily by adding thicker layer. Do not move material because it definitely will crack. Wish that price could be less. Interesting that some of it's applications are advertised as touching but their MSDS advises against direct contact.